So here we are for Round Two of the Dolce Italiano Contest in which you can win a personalized, signed copy of Dolce Italiano by Gina DePalma by commenting on any and all of the Dolce Italiano recipe posts across five blogs. Be sure to comment by 11:59 p.m. PST on Friday, December 7! Now I bet you were expecting another cake, perhaps a cookie, a tart, or even a fritter here today? 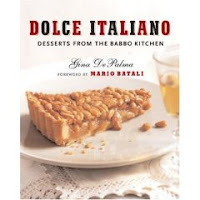 With a name like Dolce Italiano, you might think that Gina DePalma’s book is only for expert bakers or at least those with a mean sweet tooth, but that’s certainly not the case. There are also plenty of other recipes to keep everyone happy, including crackers, breadsticks, ice creams, and as you’ll see today, even an omelet. For my second Dolce Italiano recipe and this week’s What’s Cooking Wednesday, I wanted to choose something to show you just how varied this cookbook really is — and how you can find something to make from what you may already have at home — so here’s the Sweet Apple Omelet, or as I like to call it, How to Eat Apple Pie for Breakfast Without Feeling Guilty. What do I mean by that? Well we all know that the best part of an apple pie is the filling, so here we have that filling tucked inside a perfectly respectable omelet–and the results are spectacular! As Gina mentions in the book, you don’t need to limit this one to breakfast or brunch though. Indeed, I had a sweet apple omelet for dinner the other night; I always was rather fond of breakfast for dinner. I also think the sweet apple omelet would be great in a huge brunch spread–something a little more fancy than scrambled eggs, as much as I love them. So will I be making this again? Absolutely. This a fast, easy, and delicious recipe that takes something ordinary like an omelet and makes it a special treat. You can easily make it a little healthier by using only egg whites, less/no butter, less sugar (or substitute)…and why not experiment with other fruits and jams as the filling? Now who doesn’t love a recipe as easy, tasty, and versatile as this? *Note: I didn’t use grappa for two main reasons. The first is that I really don’t like grappa so I don’t have any in the house; the second is that my stomach is just recovering from a nasty virus, and I didn’t think I could even handle the smell. If you’d like instructions on how to incorporate the grappa I suppose you’ll just have to buy the book (or keep your fingers crossed that you’ll win a copy–be sure to comment)! 1. Peel and core apples, cut them into quarters, then into slices. If you’d like to make a pretty flower to garnish like in the picture above, peel the skin with a sharp knife beginning at the top of the apple in one continuous strip, as demonstrated here and then roll it up and set it on the plate. Thanks Meredith! 2. Heat a large saucepan over medium and add olive oil, followed by apples. Sauté until they just begin to turn soft, translucent, and tender, about 5 minutes. Add sugar and cinnamon, shaking to coat apples. When apples are completely tender, remove from heat and set aside. 3. In a small saucepan, melt 1 tablespoon of butter over low heat; don’t let it bubble. Add honey and swirl the pan so they combine thoroughly. Remove from heat and set aside. Prepare a serving plate dusted with confectioner’s sugar. 4. Crack eggs into medium bowl and whisk until combined. In a nonstick 10-inch omelet pan, melt remaining 1 tablespoon of butter over medium heat, swirling it around to coat bottom of pan completely. When butter begins to bubble, add eggs. 5. Use a fork or spatula to pull any cooked egg toward the center of the pan while tilting so that any uncooked egg moves to the edges. Continue moving eggs around until they are cooked, 2 to 3 minutes. 6. Very quickly, spoon some of the cooked apples into the center of the omelet in a straight line spanning the diameter of the omelet. Shake pan to loosen the omelet completely, then fold one side of omelet over apples. 7. Quickly slide the omelet onto the sugar-dusted serving plate, folding it over on top of itself with the edge of the pan or a spatula. Immediately drizzle the warm honey-butter mixture evenly over the surface of the omelet, and dust with confectioner’s sugar (I also sprinkled a little more cinnamon). 8. Serve immediately, cutting the omelet into 2 large halves or 4 smaller quarters. I did it in halves, and was plenty full after my half. Yum! I don’t like apple pie… I feel so UN-American saying that! So, I will pass on this recipe since anything with cooked apple in it doesn’t sound appealing to me. I know what you mean about the grappa. On a good stomach, the smell alone can make you sick. My husband has a bottle of it (homemade, shhh) that he drinks every once and a while. I CAN’T STAND the smell of it, as it is so strong! I am not a pie eater, either (it’s more of a crust thing for me), but I think the insides would be goood in an omelette or even a crepe! Yum. I will add the grappa 😉 Alcohol in food is fun. *Sara, actually what I thought as I was eating this was, mmm, apple pie filling in a pancake would be awesome! As for the grappa, I don’t think I’ll ever do it, but I might try a dark rum…. I love odd food combination ideas. This osunds like an interesting dish for a brunch with friends, but I too am thinking about what I could use instead of grappa…..
Hmmm, interesting concept. Would have never thought to put these combinations together…a sweet omlette…never had one. Nice pictures S.
This is great Sognatrice! Thanks for showcasing something different from Gina’s cookbook! Sounds very interesting. I’ll have to try this one too! Looks yummy and just right for Christmas breakfast! I am up to my armpits in crates of apples this year as the crop from our garden was huge. Its an original recipe which will make a change from the apple tarts, pies and cakes I have been making lately. Did P like it? This sounds wicked. I too am not sure about the Grappa – maybe Gran Marnier? I’m thinking the alcohol gets added to the apple mix while cooking? I just may have to try this recipe too. If I make it with just egg whites could I fool myself into thinking I’m a health nut (well, a nut anyway…..)? interesting combination. i never wouldve thought of it bu it looks good. hope you are feeling better. Looks scrumptious! Love the apple rose…cute! Even without the benefit of chocolate,this sounds delicious.It’s totally *not* like any Italian dessert I’ve ever had. Wonder what region it’s from. It seems like alot of the recipes call for grappa. I made the chocolate salami last night but added Bourbon for Grappa. Oh my this looks so good! I can not wait to try it. Not sure I’ll try this one but your photo does make it look tasty! *Barbara, grappa must be an acquired taste…. *Swt, hope you like it! *Rosa, P’s unfortunately been hit by the same bug as I was so he wasn’t up for trying it. Since he doesn’t like many sweet things anyway, there was really no pushing. I envy your apples! *Anna, yes, the grappa is added to apple mixture until it cooks off basically–but that’s *all* I’m giving away! Egg whites definitely say health nut to me; go for it! *Half Baked, thanks! The apple rose is so easy to make, too…who knew? *Shelley, leave it to IHOP to scoop us 😉 And please don’t mention that pink alcohol stuff. Every time I see a woman holding it in line at the store I wonder why she doesn’t believe any other cleaning product that won’t burn out the insides of your nose and make you sick in the stomach will do. Blech. *Megan, I did notice quite a few with grappa as well–bourbon sounds like a *great* substitution! *Jenn, hope you enjoy it! This is a very interesting combination. I agree with Sara the filling would be v. good in a crepe. I have never had grappa. Limoncello is the only digestivo have tried. What does grappa taste like? ooo this sounds unbelievable! What a fantastic recipe and book! Missed your blog while I was on break! Perfect! I love omelets and I love apple pie … this one’s a keeper, thanks! This sounds like a great Christmas Brunch dish! Mmmmm… I love apples! Can you really taste the grappa after cooking? I used to worry about wine or sherry [whatever] in recipes, but on the whole they never tasted of alchohol once they were served. This is an interesting combination. Thanks for sharing. *Debi, apple lover here too! *Maddy, it’s very possible that you don’t taste the grappa after it’s done, but I wasn’t willing to risk it on a recovering-from-a-stomach-bug tummy. I have to say, though, I am pretty sensitive to alcohol in food–it’s used in desserts *a lot* here. With wine, I can usually taste the difference in sauces with or without wine, both red and white. It’s not that they taste alcoholic, per se, but to me, it’s usually clear where a certain flavor (and smell) has come from. Like I said, I may just be sensitive. *Food Hunter, hope you like it! Oh oh oh, this recipe is a keeper, thanks a lot! I’ve never thought of making omlettes as a dessert dish. Thanks for the idea. I think I am going to gain holiday weight just looking at all the photos of the delicious desserts in this series. OH, my, I hope I win this book!! If I don’t, I’ll be buying it!! Another delicious recipe. Thanks, Sognatrice and Gina. I might make this with quince instead of apple (with a bit of vanilla and clove instead of cinnamon). Why, particularly, is grappa included in the recipe (and, evidently, in so many of the other recipes in Dolce Italiano)? Is Gina a big fan of it, or do traditional Italian sweets really call for it? I don’t even know what grappa is? Obviously alcohol of some sorts. Is it worthy of a post? (I know you can post about anything and make it interesting and informative) And what about the peperoncini? Yes back to the recipe. I like apples and the sweet/salty thing always works for me. This looked good and I love how you did the rose garnish. I saw that too over at Meredith’s and thought it was so pretty and easy. I’ll be using that trick somewhere. eating apple pie for breakfast without feeling guilty? I love it! I would think a little rum-caramel sauce and bit of vanilla bean gelato would be like going to heaven. The slightly savory flavor of the eggs is a perfect counterpoint to the apples. Yum! Yum! YUM!! *Deborah, best of luck, but anyway you’ll be a winner when you’re holding your copy! *Cheeky, ooh is grappa worth a post! That great source, Wikipedia, has some info on it and I bet most people who have tried grappa have something to say about it. I can actually drink it if I’ve already been drinking and what does it matter now, but I’d never pick it. *Cbright67, I *love* the way you think!!! I can’t say I would have ever thought of filing an omelet with apples. I love eggs and apples separately – perhaps this would be a happy marriage after all. I won’t believe it until I taste it though. It’s looks delish in the picture. I want to win, but I don’t think my waistline could handle it. Every single one of these recipes has looked fabulous and I’m holding myself back from making each one. Are you gaining weight doing this? Come on, guys, a little grappa in things isn’t nasty. It increases the natural flavors, usually. I don’t drink it, however. This sounds like a me thing. That looks DELICIOUS! I’m going to have to hide this post from my hubby because he goes crazy for apple dishes. Or maybe I’ll add this to the stockpile of secret, special-occasion recipes. 🙂 Thanks so much for sharing! i like that…how to eat dessert for breakfast without the guilt!! this is great to add to the we-have-visitors menu. I WANT! 🙂 That looks delicious. WOW – even a breakfast treat! Sounds really yummy too. I’m thinking that might be an ideal breakfast to serve on Christmas morning. I love apples so I will definitely be trying this recipe. I’m not too sure about the grappa either. We brought a small bottle back from Italy this year – it tastes like paintstripper! I love the thought of tucking into this dish for breakfast..YUMMY!! Thanks for posting the recipe. There isn’t much more I can say than YUM!!! How timely…I had cooked apples with my breakfast this morning! Thanks so much for posting the recipe. I have never thought of doing a sweet omelet. This sounds really good. Looks amazing! I’d probably replace the grappa with brandy. What a coincidence, my wife made omelets for dinner last night. Cheese for me and a Western for herself. I’m not adventurous for all the stuff she fries up and puts in hers! I’ll have to remember “sweet apple omelet”. *Giusi, you’re right about the grappa of course. I just couldn’t manage it with my fickle stomach otherwise I would’ve at least tried it. Well plus I would’ve had to actually leave the village to buy a bottle, and that wasn’t happening either. Next time though, and I’ll report back! *Qualcosa, excellent point–great way to impress visitors in the morning! *Tea, yeah! That’s the spirit! *Wyndesnow, I hope you’ll try it! *CJ, as you can see, there’s been quite a debate on the grappa in the comments, but if you have it anyway, it might be worth a try…. *Collywolly, apples and eggs! Yeah! *Salemhouse, this recipe convinced me that I need to have cooked apples more often…they’re so good and easy to make! *Gil, one of the things my grandmother used to make for supper a lot was scrambled eggs with bits of whatever meat was around (sausage, salami, ham) and onions, sometimes green peppers. Funny, though, that I never really got into the Western omelet thing in the States, but now I’ll make a similar frittata here every now and again. Reminiscent of a Dutch apple pancake, the Italian way, keep it simple. Yum! I would eat breakfast if this were in the kitchen (already made of course..by someone else)! Love apple pie filling. This could be really good with pears as well. Thanks for showcasing something slightly different from Gina’s book. 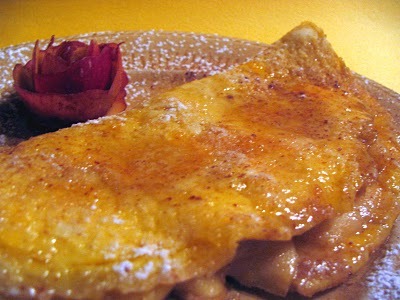 I do love apple pie, but I would have never thought of pairing sweet apples with an omelet like this. Very unusual, but I imagine it’s probably pretty good. Interesting, I haven’t done something like that before! *Jessica, hah! That’s the trick isn’t it? Getting someone to make it for you! *Dtsweir, glad you enjoyed it. Mmmm pears! *Hedi, give it a go! Hmmm…apple pie for breakfast…I’m hungry now! Wow! See what I really dislike about pie is the crust. This is my idea of great apple pie. And yes I do love the filling! Oh wow, that looks So devine!! oh! That looks so yummy! This looks delicious. It’s similar to something my father made when I was little. He didn’t cook often, but had a couple of specialties. I will be trying several of these for out Holiday dinners!! Thanks!! I’ve rationalized eating apple pie for breakfast by eating apples on my pancakes… but I’ve never had the apple / egg combo. This looks worth a try! *Karina, more info on grappa today! *Jen, sounds like my grandfather–breakfast was definitely his thing. I am SO angry at myself bc I ate at Babbo last night, ate myself into a food coma and could not do dessert!!! I saw Gina’s book on the way out, felt immediate shame and regret then I thought of all of you and missed my dessert ladies blog world. 2008: I bake. I happen to be eating a golden delicious apple at the moment (had to set it down to type). I love apple pie, but I can not at all imagine these flavors together (apple, egg). I’ll scroll down and see if you describe it. *Taffiny, I didn’t really describe it, did I? I think it works so well because of the sweet and savory mix that some of us love so much. I’m the kind of girl who can’t eat scrambled eggs without a jammed piece of toast (even though I love plain toast, or with cinnamon, etc. otherwise)…something fruity and sweet with eggs has always just gone well for me, and this worked too. I love everything with apple, and this looks so good to me! Two years later I am craving this omelet and am back looking for the recipe! Delicious! you bet i’ll be tryin’ out this one, I’ve been to Italy once, in Milan, and have been missing it! Lovely write-ups btw. Oh my, this looks *amazing*! I can’t wait to try it!